Tax day is here and while most people dread Tax Day April 15th, it doesn’t have to be a bummer. If you’re looking for ways to save a little bit of money on April 15, visit one of these restaurants for free food or a discounted meal. Tax season is a stressful time of year, whether your are looking forward to a refund or preparing to pay Uncle Sam. There are many freebies and discounts being offered by retailers to celebrate the end of the dreaded tax season. • Applebee’s: April’s drink special at Applebee’s is the Strawberry Dollarita with a Twizzler straw. As its name suggests, it’s just $1 all month-long, so you can enjoy it on Tax Day. • Bruegger’s Bagels: The annual Tax Relief Deal is back April 10 to 15 at Bruegger’s. The Big Bagel Bundle (13 New York-style bagels with two tubs of cream cheese) is $10.40 ($3.50 off). To get the offer, join the Bruegger’s Inner Circle rewards program, or claim the offer on Brueggers.com. • BurgerFi: Double cheeseburgers are $4.15 on April 15. Limit of one per person. Get the offer by downloading the BurgerFi app. • Cici’s Pizza: Use this coupon to get an adult buffet for $4.15 on Tax Day at Cici’s. Large drink purchase required. • DoorDash: If tax stress makes you want to curl up on the couch, order in. DoorDash is offering $20 off on any order for new customers for the rest of the month. 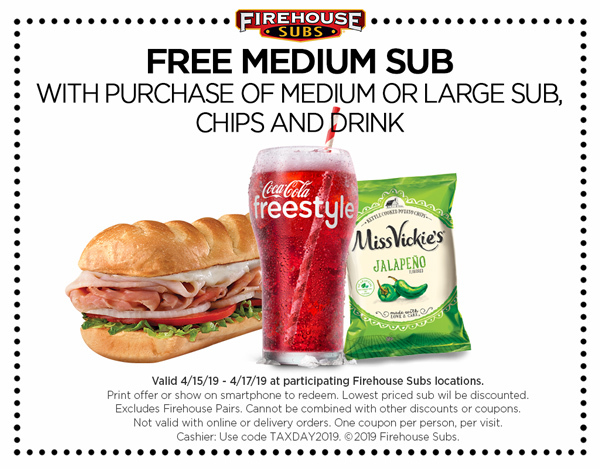 • Firehouse Subs: Purchase a full-price medium or large sub, chips and a drink and get a free medium sub. Deal valid April 15 to 17. Use this coupon. • Kona Ice: Trucks in many metro areas will be giving away free shaved ice on April 15 in honor of what it Kona calls Chill Out Day. • Noodles & Company: NoodlesREWARDS members will receive $4 off online and mobile orders of $10 or more from April 10 to April 15. To get the offer, sign up for the rewards program by April 9. • Kohl’s: Whatever you’ve been meaning to splurge on, use this promo code to get 15% off purchases over $100. It’s good all April long. • Macy’s: Get 40% off when you buy two or more pairs of women’s shoes by April 15. • Naturalizer: Use this promo code by April 15, and get 20% off when you buy two pairs of shoes. • Office Depot and OfficeMax: Get free Workonomy shredding services at all Office Depot/OfficeMax retail stores March 31 through April 27. Bring up to 5 lbs of documents and present this coupon. The IRS suggests keeping tax records for three years, so bring in any old returns hogging space in your filing cabinet. • Sephora: Until April 17, snag this freebie: Free Urban Decay Eyeshadow Primer Potion trial size with orders over $25. Use this promo code.